This homestyle, traditional Romanian White bean soup with seasonal vegetables and a light seasoning of dill and parsley is a nourishing vegetarian meal. It’s been high time that I posted recipe for a Romanian dish. I have been here for more than 6 months now and although it is difficult to find vegetarian dishes amongst traditional Romanian cuisine, there surely are a few gems like this White Bean soup. My mom used to make the white bean soup in winters with all the root vegetables that we had. There will be this big simmering pot of beans, and vegetables when we returned home to warm us. And it was seasoned only with dried dill and parsley. We had plenty of dill and parsley in summers and she would dry them for winters. Common vegetables in the traditional Romanian white bean soup are season winter vegetables like onion, garlic, carrots, celery and red bell pepper. I kept it just that way. I like to follow seasons when it comes to choosing food and I’m not a big fan adding vegetables out of season. The beauty and the taste of the soup is in its simplicity. One more thing that I was told as a mother’s tale was to boil the white beans in 3 changes of water. So you boil them once, throw the water; boil then again, throw the water and then boil them again the third time till they are soft enough. And ALWAYS add warm water to the beans and not cold water. Now this is more than just a mother’s tale! This very important step helps eliminate the biggest problem of eating beans. The gas! Beans contain short-chain carbohydrates called galacto-oligosaccharide and fructans. These sugars are not completely absorbed by the stomach or small intestine and they are broken down only by the gut bacteria in the large intestine. This results in gas that comes out as flatulence. Boiling beans in multiple changes of water helps reduce the flatulence. Oligosaccharides are water soluble. So, when you boil beans, the sugars (partly) get dissolved in the cooking liquid and by throwing away the liquid some of these sugars are eliminated, resulting in less flatulence. Soaking and rinsing the dry beans before cooking also helps reduce the sugar content. Beans are heart-healthy as they are rich in soluble fiber. White beans are low in fat. Beans help in weight loss as the complex carbohydrates in them are digested slowly, keeping you full for longer. Beans are rich in antioxidants, which reduce the risk of cancer. 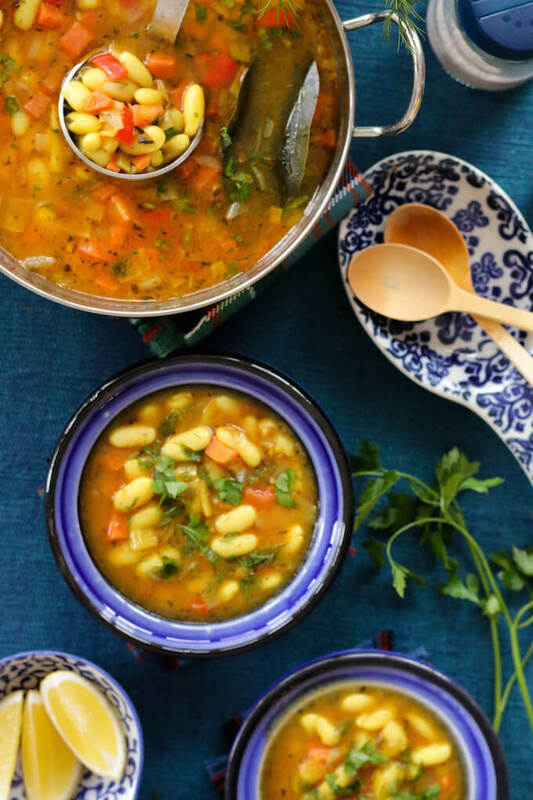 Full of protein, fibre, complex carbs, vitamins & minerals; this Romanian White Bean soup is a comforting bowl when your body needs a little tender loving care. The simple recipe has been passed on from generations of moms and friends to finally land on my blog :-). If you like this recipe, please take a moment to rate it below and/or leave your thoughts at the end. It really encourages me to keep exploring, learning and improving. 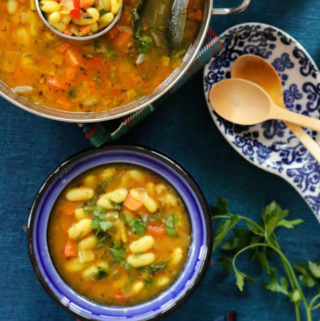 Homestyle, traditional Romanian White bean soup with seasonal vegetables and a light seasoning of dill and parsley is a nourishing vegetarian meal. A simple homely recipe that is seldom found in restaurants. Every bowl of this soup is full of proteins, fibre, complex carbs, vitamins, and minerals; wishing you health and happiness! Drain the soaked beans. In a deep stock pot, bring 3 cups of water to a boil. Add some salt and drained beans. Bring to a boil. Drain and add 3 more cups of warm water. Again bring to a boil, drain and finally add 3 cups more warm water, some salt and let the beans cook covered until they are tender. In a separate pot, heat olive oil. Add garlic, ginger and chillies. Sauté for a minute. Add the chopped vegetables and the stock. Cook covered till the vegetables are soft. Drain the cooked beans and add them to the pot with vegetables along with tomato puree. Boil together for about 15 minutes. Mix in the spices and lemon juice. Ladle into bowls and serve hot garnished with some fresh dill and parsley if in season. *Preparation time does not include time to soak the beans. Ideally dry beans should be soaked overnight in warm water but try to allow for at least 3-4 hours of soaking. If you are using canned beans, wash them under running water till there are no bubbles. **Chilli is totally an Indian addition to the soup. We need to have some heat and it is especially good in winters to add warmth to the body but it is totally an optional ingredient. 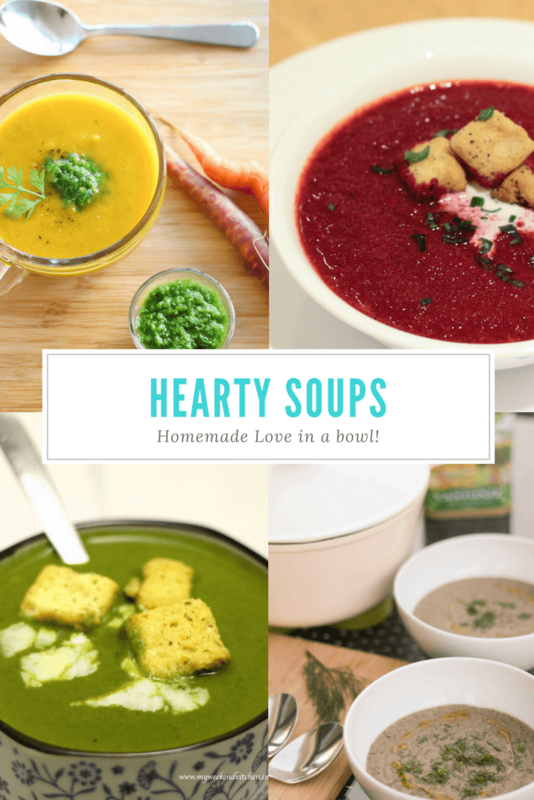 I love soups; they are healing, nourishing and just the comfort you need in this changing season. For more delicious soup recipes, click on the image below. There are many traditional, vegetarian and vegan soup recipes too. Love this recipe Ashima! Wondering if I can make it with chowli beans? Thanks! And yes you totally can use chowli (black eyed peas) for the recipe :-). Let me know how it goes!